The Yorkshire Terrier is intelligent, tough, determined, playful and lively. Yorkshire Terriers are fairly quick to learn with positive and consistent training. They are tolerant of children, provided they are not treated like toys and have their own space to which they can retreat. Yorkshire Terriers can be overly brave towards other dogs, but they generally get along fine with other household pets. Yorkshire Terriers always bark when they sense danger and will always alert their owners when visitors arrive. These terriers become very attached to their family and are not always ideal for the elderly or small children with their lively and exuberant nature. 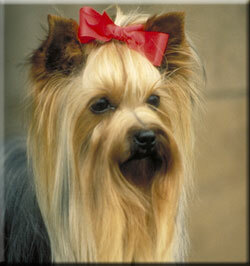 Yorkshire Terriers need thorough daily grooming with a brush and comb. Some pet owners choose to have the coat trimmed, if unable to meet these grooming demands. The hair is usually kept out of the eyes with a bow tied in a top knot. The ears should be checked regularly and the loose hairs need to be removed from the ear canals. If Yorkshire Terriers are being shown the coat is usually protected, by being rolled up in curling papers. This breed is suitable for a flat or small home as they don't need much exercise. Yorkshire Terriers generally adapt to their family activities for their exercise needs. The Yorkshire Terrier has evolved from the Waterside Terrier, a small longish coated terrier seen in Yorkshire for many years, the Skye Terrier and the old English rough coated Black and Tan Terrier. It was in the middle of the 19th century that these crosses resulted in a distinct breed type. They were exhibited as Broken Haired Scotch Terriers in 1861, but by 1870 their name was changed to the Yorkshire Terrier. General Appearance: Elegant, small and compact. Color: Dark steel blue with tan on the skull, muzzle, ears and lower legs. All the tan colored hair strands should be darker at the root and paler towards the ends. Coat: Long, silky, soft and perfectly straight. Tail: Commonly docked and carried slightly higher than the level of the back. Ears: Small, V-shaped, covered with short hair and carried erect or semi-erect. Body: The body is very compact and well-proportioned with a level topline and well-laid back shoulders. While Yorkshire Terriers are overly pampered, it is a mistake to think of them as lap dogs. They have the typical terrier character, of being lively, energetic and highly-spirited.